Salt Chlorination-No more mixing, measuring or mess. Forget about mixing, measuring or messing around with liquid or tablet chlorine. Say goodbye to red eyes, itchy skin, heavy chemical odors and unwanted bleaching of toys and clothes. Now there's an easier, more efficient and cost-effective way to satisfy 100% of your pool and spa's sanitation needs and enjoy water that’s always clean, clear and luxuriously soft. Use a minimal amount of salt. A teaspoon of salt per gallon is all it takes. Salt won't wear out or evaporate; it's used over and over again. Day in and day out, you have fresh, pure chlorine introduced evenly throughout your swimming pool and spa. Salt-chlorinated water is perfect for plaster, pebble, vinyl and fiberglass pools up to 40,000 gallons. What if your pool could self-adjust; automatically test its own chemistry, and balance and sanitize the water? What if it always knew what the water needed and adjusted continuously, eliminating unhealthy highs or lows? Ensuring brilliant, balanced water all the time, automatically. 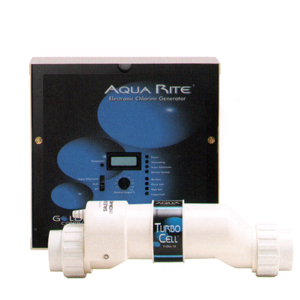 You can get your water in balance with Goldline Controls. 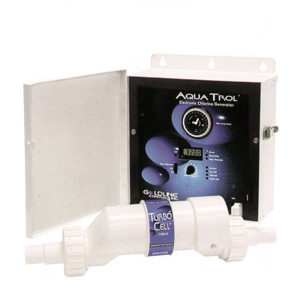 This professional-grade ORP and pH sense-and-dispense technology was previously only available for commercial pools. Goldline Controls now offers an economical approach, with the same level of accuracy, for residential in-ground pools. 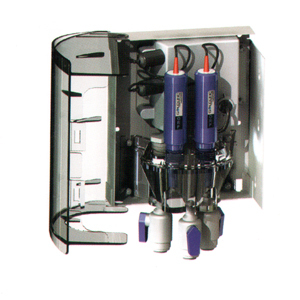 For more information on how Sense and Dispense works, contact Goldline Controls for a Total Pool Chemistry brochure. Salt chlorination with Sense and Dispense. 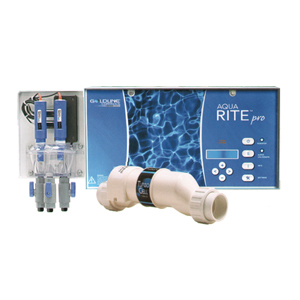 Professional-grade Aqua Rite Pro takes pool and spa sanitation and chemistry management to new levels, building upon the industry-leading salt chlorinator-Aqua Rite. This integrated solution automatically senses ORP and pH levels and dispenses a self-renewing supply of pure chlorine generated from salt, while controlling pH. Integrating chemistry automation with sanitation eliminates the need for an additional device on the pool pad and lowers installation costs. So now you get the most consistent water quality possible, water that's brilliant, soft and silky-smooth, for the best possible pool experience. Aqua Rite and Aqua Rite XL provide complete pool and spa sanitation using ordinary salt. Their extremely safe electrolytic technology uses a low voltage electrical charge to convert a small amount of salt-approximately one teaspoon per gallon of pool water-into a virtually endless supply of fresh, pure chlorine. This environmentally friendly and self-renewing process produces up to 1.45 pounds of chlorine a day, enough to keep the water in a 40,000 gallon pool clean, clear and luxuriously soft. The affordable salt chlorine generation solution for above-ground pools. Aqua Trol employs the same proven electrolytic technology as Aqua Rite but it properly rated for above-ground pools up to 20,000 gallons.